We offer this guide primarily for people who want to test the germination rate of seeds they have harvested themselves or older seed they have stored. 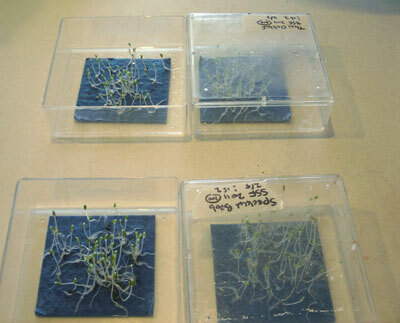 The idea of a germination test is to take a random sample of seeds from your lot or package, put them in the conditions that make them most likely to germinate, and see how many develop into healthy sprouts. Expressed as a percentage, this is the number we print above the packing date on Southern Exposure seed packets. When you're testing germination rates for your own use on a small scale, you don't have to get as precise a percentage, so you may want to take a sample of just 5 to 20 seeds. Soak a piece of blotter paper, a paper towel or a coffee filter in water. Spread the seeds you've counted over one half of it, then fold the other half over the seeds. Fold it or roll it up, put a rubber band one inch from the top, and place it in a clear plastic bag or airtight container to keep it from drying out. If you don't know how long the seeds will take to germinate, open the test up after a couple of days to see if any seeds have germinated. Count any healthy sprouts, record the number, and take them out of the test. Make sure you don't remove any unsprouted seeds. We only count sprouts that have both a healthy-looking root and a healthy-looking shoot. Spray the remaining seeds with water from a spray bottle, and roll or fold it back up. Large seeds like peas, corn, and beans will need more water. Cucurbits (squash, pumpkins, cucumbers, melons, gourds) should only get watered every 3-5 days, otherwise they might rot. Always make sure the tests remain damp, but not dripping wet, and at an appropriate temperature. Most seeds like to be warm, but not hot. Cool-season crops like peas, spinach, parsnips, and salsify germinate best at cooler temperatures (55-75 degrees F); peppers germinate best at very warm temperatures (75-90 degrees F). The best temperatures for each crop's germination are mentioned in our cultural notes for that crop. Continue to check every few days until you have concluded that all the viable seeds have germinated. If you haven't seen a new sprout for a while, the test is probably done. Corn, beans, and peas will generally germinate in just two or three days. Parsnips, on the other hand, can take 3 weeks. Most other seeds take a week or two. If your paper towel test shows a low germination rate, you might want to try a soil test or Tupperware test and see if the seeds do better that way. Some seeds, like peanuts and malabar spinach, just don't germinate well in paper towels. For these, plant the seeds in a tray of wet potting soil. 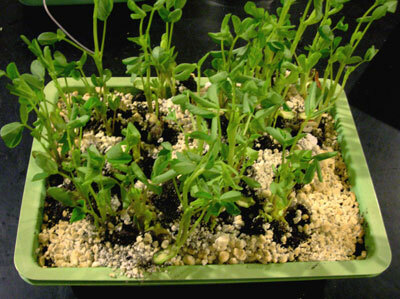 We use perlite as the top layer when we do germination tests in soil. Keep the soil evenly moist and warm until you have concluded that all the viable seeds have germinated. 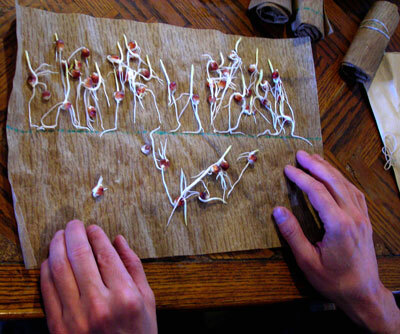 Each time you count the germinated seeds, clip their sprouts near ground level. The bigger the little plants get, the more water they will use from the soil each day; if they get too big, the soil will dry out much more quickly. Clipping sprouts also ensures that you won'tt get a confusing tangle of growth. Some seeds, like chamomile and lemon balm need to be exposed to light in order to germinate. For these, cut a square, a few layers thick, of paper towel or blotter paper, that will fit flat on the bottom of a piece of clear Tupperware or another similar container with a tight-fitting lid. Wet the paper, put it in the container, spread the seeds out on top, close the container, and keep it in a warm place. Check it regularly, removing and counting germinated seeds, and keeping the towel moist, until you conclude that all the viable seeds have germinated. Some seeds, like Echinacea, and salsify will germinate best after a period of moist cold (stratification). For these seeds, you can set a test up and put it in your refrigerator before putting it in a warm place. The best length of the period of moist cold depends on the species. Our variety descriptions for plants needing stratification include guidelines of how long to stratify them--use the same length of time whether you are planting or doing a germination test. Some seeds germinate better if they are rubbed with a rough material before planting (scarification) For example, when we test gourd seeds, we first lightly scarify them by lining the inside of a jar with sandpaper, putting the seed in, and shaking for a minute. Some seeds, like tomatoes, peppers, and certain flowers, need access to potassium nitrate (saltpeter) in order to germinate. This substance is found in soil, but when we're testing these seeds in paper towels, we soak the towels in a solution of 2 grams of potassium nitrate per quart of water. We use this same solution instead of plain water when we water these tests.